Featuring one of the greatest lineups ever assembled — including Bruce Springsteen, The Rolling Stones, Bon Jovi, The Who, Kanye West, and Alicia Keys — this extraordinary concert film documents the event that would raise over 50 million dollars to aid the victims of Hurricane Sandy. New York City has a special place in the hearts of musicians and performers. It’s a place of inspiration, discovery and validation. 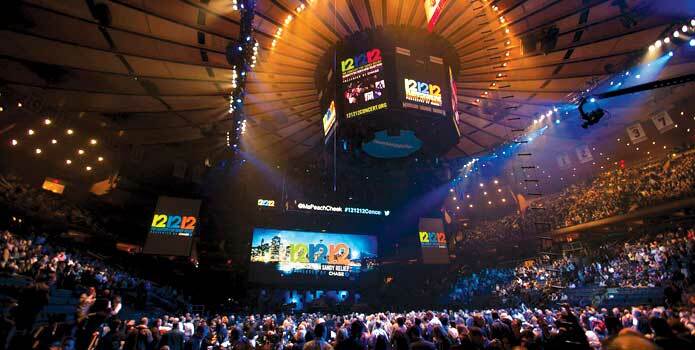 So when Hurricane Sandy dealt a blow to that hallowed ground, the entertainment community rallied behind the city by putting on a show at Madison Square Garden on the date of 12-12-12. This documentary captures the incredible gathering of talent that turned up on stage and behind the scenes. We’re used to seeing concerts where the headline act is preceded by up-and-comers. The Concert for Sandy Relief was more like one headline act after another: Bruce Springsteen & The E Street Band, The Rolling Stones, The Who, Jon Bon Jovi, Eric Clapton, Alicia Keys, Kanye West, Billy Joel, Paul McCartney, and on and on. Even beyond that, the occasion prompted some one-of-a-kind moments: Roger Waters and Eddie Vedder trading verses on “Comfortably Numb”; R.E.M.’s Michael Stipe performing with Coldplay’s Chris Martin; Adam Sandler making up his own lyrics to a classic Leonard Cohen song, rhyming “Hallelujah” with “Sandy, screw ya.” Other boldface names (Chris Rock, Jon Stewart, Martha Stewart, and Whoopi Goldberg, to name a few) make appearances and staff the phone banks in support of the Robin Hood Relief Fund. Backstage, we get to observe the troubleshooting of the event’s producers James Dolan, John Sykes, and Harvey Weinstein. Let’s just say these three are not men you’d want to disappoint. They know how to put on one helluva show.